Finnish wood-based diesel fuel has been successfully tested by UPM both in the laboratory conditions and traffic. The results of the tests clearly indicated that UPM BioVerno, UPM’s renewable diesel works just like the best diesel fuels. The laboratory tests of the renewable UPM BioVerno diesel were conducted at the VTT Technical Research Centre (VTT) while the field tests were conducted in Helsinki region bus traffic together with Helsinki Region Transport (HSL). 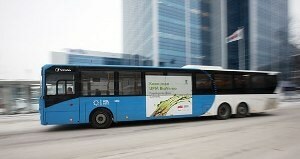 The bus field tests’ measurements spanning a year were conducted by VTT. The tests were also supported by Transdev Finland Oy, Volvo and St1. The initial laboratory tests were conducted with Euro III Class buses, which are used a lot currently on Finnish roads. The UPM BioVerno diesel produced unmistakably lower emissions than fossil diesel. In comparison to other advanced fuels, the emissions of the UPM BioVerno diesel were at least as minimal as theirs. The use of UPM BioVerno diesel in the current bus fleet instead of fossil diesel would lower emissions from public transport significantly. This is good news as this Finnish wood-based fuel could immediately – and positively - affect the air quality in the Helsinki region. Transdev Finland conducted the field tests with buses. They used a standard bus route between the city of Kerava and Helsinki using four identical Volvo Euro VI Class buses that have efficient engines and low emissions. The test runs were performed using 20%, 50% and 100% UPM BioVerno diesel. St1 served as the fuel logistics provider in the tests. The test results revealed that the UPM BioVerno diesel is functioning very well in all blending ratios – in the same way as the best diesel fuels – and fuel consumption was exactly the same. The four buses, together, traveled approximately 400,000 km without facing any fuel-related incidents. The Euro VI Class buses are fitted with diesel particulate filters (DPF) and provided with selective catalytic reduction (SCR) catalysts which are capable of decreasing emissions to a negligible level, therefore the tests did not show any major differences in emissions between diverse fuels. In Euro VI Class engines, the fuel influences the emissions mainly indirectly: superior quality fuel, such as UPM BioVerno, ensures that the exhaust cleaning systems function well even after driving considerable mileage. We are happy with the test results – they show that UPM BioVerno could fully replace fossil diesel in current bus traffic. Biofuels have a significant role in our company’s targets, as we are aiming for carbon-free public transportation in the Helsinki region. The bus field tests formed a portion of a larger BioPilot project organized by VTT. The project’s goal was to encourage companies to commercialize renewable energy solutions in traffic. “Advanced biofuels are a tested, well-functioning solution and a great opportunity for Finland. They could be our fast track to low emission traffic as they could be taken into use immediately and clearly cut down the emissions,” says Research Professor Nils-Olof Nylund from VTT. HSL and VTT have begun the BioSata project, which is a natural continuum for the BioPilot project which has currently ended. The new project is scheduled for application phase and its goal is to optimize the level of biofuels used in HSL bus traffic up to 70-90% by the end of this decade. UPM’s renewable diesel, which is called UPM BioVerno, is an innovation that will decrease greenhouse gas emissions by up to 80% and tailpipe emissions considerably, compared to fossil fuels. This superior quality biofuel is developed from a residue of the pulp sector, crude tall oil. The UPM BioVerno is a suitable fuel for all diesel-powered vehicles. In January 2015, UPM began the production of wood based renewable diesel in the UPM Lappeenranta Biorefinery. Annually, this biorefinery has a production capacity of 120 million liters of renewable diesel. The UPM BioVerno has been approved for using a Finnish Key Flag Symbol. The symbol is granted to products that have been manufactured in Finland and have a domestic origin degree of more than 50%.